Musket storage boxes are available for Civil War Springfields, Enfields, Sharps Rifles; also for Revolutionary War Brown Bess, Charleville -- and custom work for nearly any armament specified. Whether transporting your muskets and rifles to reenactments, living history presentations, or through airport terminals, the musket storage box attracts interest and admiration. Blued steel hinges and lockable draw clasps hold the box securely closed. Brass corner guards may be added for additional protection and attraction. Rope handles at each end and a double rope or blued steel center handle provide for the various methods of carrying. These unique and ruggedly attractive Musket Storage Boxes are suggestive of something right out of a Civil War armory's warehouse. 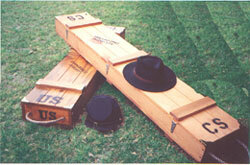 Incorporating features of the original musket boxes, we've designed something more manageable. Expertly hand crafted of knotty pine, clear pine, fur and poplar, all musket boxes are solidly glued, pegged and screwed together. 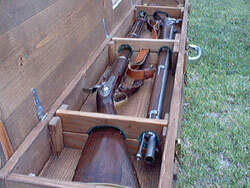 Inside the musket box, custom padded wood stocks secure and protect your rifles. 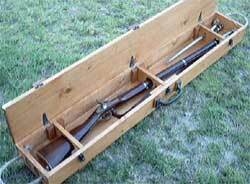 Both single and double musket boxes are available. 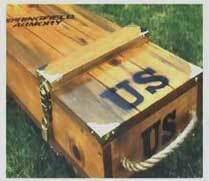 OUR SINGLE MUSKET BOX SHIPS TO EUROPE FOR ABOUT $90.00!